For Essex Book Festival 2018 we invited Ruth Raymer to be writer-in-residence at Jaywick Martello Tower. Ruth spent a week at the tower, talking with Jaywick residents and visitors, researching into its history, writing and delivering writing workshops, and storytelling as part of our Festival Finale on 31 March. 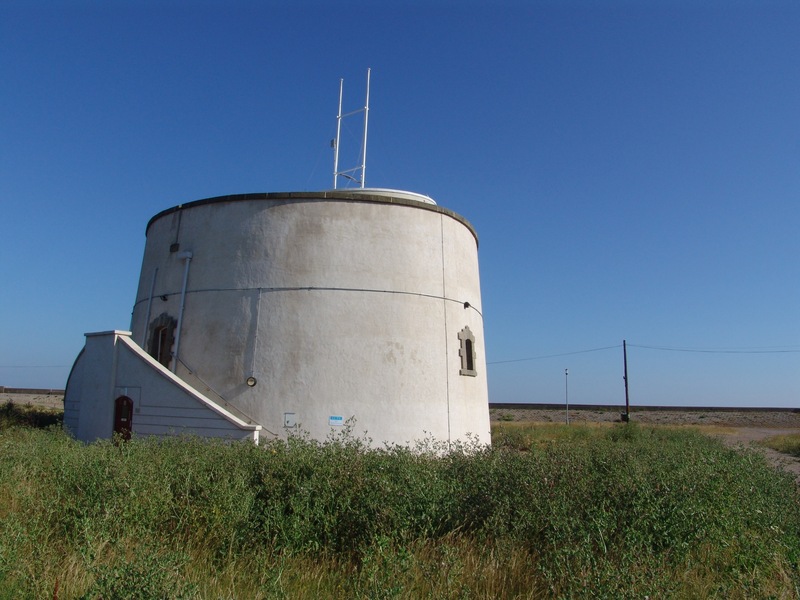 Tower C is a tower built in wartime to protect the shores of eastern England, and to act as a threat to Napoleon Bonaparte, along with its 102 brother towers dotted along our coastlines from Dover to Aldeburgh. Such a deterrent were they, that Bonaparte never invaded. These places built in wartime are now variously derelict, abandoned, re-developed as dwellings, or in some cases destroyed or lost to the sea. Tower C is enjoying a revival of its fortunes since its purchase by Essex County Council. It is very much a peaceful place, but it is also far more than that. The tower has become a part of a thriving community, a community of artists and creatives yes, but also a village community. It is a gathering place as much as a place to develop or show off your arty side. There is a relationship between the people of the village of Jaywick and the Tower that builds on the ideals of peace and harmony found throughout the community. Friendships are forged here, and the welcome is genuine and all-encompassing. There is only one member of permanent staff, who seems to understand their place in the community at large and as custodian of a part of our heritage. The current custodian of the tower tells me that some folk believe she has a symbiotic relationship with the tower. When she goes away on leave, it sulks then on her return throws tantrums – a glitch in the plumbing for instance. I would suggest that symbiosis goes further. She is part of the beating heart of the community she serves, able to walk the streets and have something to say to everyone she meets. Perhaps more importantly though, she listens. She listens with an open mind and heart to all the concerns of the day. She listens to the small things and the big ideas. She tries to provide an environment of support and nurture within these walls and without. It is obvious to me that Kerith Ririe loves this place, its people, and this tower which sits in their midst. As a public building, the tower and those who work in it, look to provide a space in which the two communities using it – the more transient community which occupies the holiday caravans surrounding it, and the residents of the village of Jaywick in which the tower stands, can participate and feel they are stakeholders in this old building’s future. The tower and its environment also have a symbiotic relationship even though at first the environment tried to reject it. When the tower was constructed, it began to sink backwards into the ground. For that reason, Tower C appears to be more squat that its brothers close by. It is at least four feet shorter, with its foundations deep in the sand and marshland upon which it was built. Given our rising sea levels, it is also probable that the tower was further away from the sea than it is now, with the gun battery which was built in front of it, now lost beneath the sea at high tide. Surveys have failed to find a trace of it inland as far as the current seawall, but we know it was shown as extant on maps in the late nineteenth century. The tower built to defend against attack from the sea is now protected by a wall built to prevent it being attacked by the sea. With good management, the wall will last at least another 50 years. But then what? Will the tower be lost to the sea? It is possible, as some on the Suffolk coast have already been lost. For now, the tower sits in a landscape that is home to rare sea grasses and other endangered species of flora and fauna. Continued interest in the tower as a National Monument and listed building, means nature supported here also fairs well according to Environmental Impact studies carried out in the last decade. The concrete plinths which surround the tower; once supporting holiday caravans but now left to be reclaimed by nature are gradually breaking up and being colonised by mosses and lichens. The concrete path which surrounds the tower is fairing a little better in that it is still intact. I walked slowly along it in a clockwise direction, taking note of the soft grasses and slightly marshy land beside it, listening to the sharp cries of the terns above me. I was quickly aware of the meditative nature of walking the path, eight or ten yards away from the tower. My sense of time was suspended, and, in my mind, I could hear the shouting and laughter of children at play, running around the caravans here throughout the 1990s and way back to the early part of the twentieth century. Walking on, I heard the cries of war-torn Britain in the great wars of that century. A time when the tower was used as a lookout tower and heavy guns were sitting on her roof once more; the sounds of the bicycles of the 8th (Cyclist Battalion) of the Essex Regiment being stood against the walls of the tower as the men arrived to take their watch during WWI. Then for a while, there was silence and only the sounds of the sea. The one constant companion of the tower has been the sea. Always beside it, sometimes breaching the sea defences and swirling around the heavy skirts of the tower, but never undermining it. As I reached the end of the path, once again the I could hear the ghosts of activity – shouts from the sergeant to the three men who would have manned the tower with him in its early days; the sounds of music from the grand military ball held here when the tower was first built. Finally, the sounds of construction – three-quarters of a million bricks expertly put together to create the tower but soldiers and navvies. As the path ends, I am confronted by an expanse of water and marshy ground that I must cross to get back to the doorway let into the walls at the front of the tower. A reminder perhaps, of how the land was before ever the tower was here – a saltmarsh. Jaywick has been susceptible to flood throughout its lifespan. It stands on land clawed back from the sea and marshes by human endeavour. Much of the village stands just below sea level and has suffered deeply in exceptional Spring tides in 1953, 1947/8/9 and 1936, for instance, but there is a history of flooding over the last 1000 years in the area. In the Anglo Saxon Chronicles of 1099, there is an account of flooding such that ‘on the Festival of St. Martin, the sea flood sprung up to such a height, and did so much harm, as no man remembered that it ever did happen before.’ But still the Martello Tower stands, strong, resilient and thwarting all that nature throws at him. Through over two hundred years, the original fabric of the building remains in good condition. With the careful restoration completed by Essex County Council in 2005 and the many volunteers who love this place, it has a rosy future.